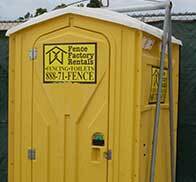 ARE YOU LOOKING FOR A RELIABLE COMPANY TO HANDLE YOUR TEMPORARY FENCING AND PORTABLE TOILET NEEDS? CALL FENCE FACTORY RENTALS! 888-71-FENCE. WE CARE ABOUT OUR CUSTOMERS. At Fence Factory Rentals, we pride ourselves in providing superior service at competitive prices. We supply temporary fencing and portable toilet solutions to commercial, industrial, residential, and government entities. Our long list of satisfied customers includes contractors, home developers, school and park districts, universities, military bases, event planners, business owners, and homeowners. With offices in Ventura, Atascadero, and Fresno, Fence Factory Rentals is able to dispatch our services to the majority of the state of California. Fence Factory Rentals’ employees value quality and dependability. Our staff is loaded with long-term employees who understand that the customers are our priority. That is why so many of our customers use us time and time again. Whether we are installing a temporary fence or cleaning a portable toilet, our staff is trained and encouraged to provide the type of service that meets your expectations. Our staff is also required to attend weekly safety meetings in order to keep safety at the forefront of their minds. At FFR we understand the risks that are involved whenever anyone steps foot on your property. We take safety seriously for everyone’s sake.